I have been struggling with my dentures. Really struggling. I talked to my dentist about it and he suggested dental implants, but the price was way over anything I can afford. I don’t really want to continue with the dentures, but I just don’t like how they move around. I do use adhesive. It helps some. Not a lot. Unfortunately, it also feels kind of gross. Is this just something I’ll have to adjust to or is there another treatment option I’m overlooking? I hate to hear that patients are left grappling for answers when their dentists should be giving them all their options. And, you do have some options here. While some people adjust to dentures, others never do. You didn’t mention how long you’ve had your dentures. If they’re fairly new, they shouldn’t be sliding. Your dentist needs to adjust them. Free of charge. However, if you’ve had them for several years, you could be at the early stages of facial collapse. The longer you wear dentures, the more your jawbone shrinks. Eventually, you won’t have enough jawbone left to even keep dentures in. This is why your dentist mentioned dental implants. The implants provide prosthetic tooth roots which your body interprets as you still needing your jawbone, leaving it intact. I don’t know if the price quoted to you for dental implants was a single implant for every missing tooth or for implant overdentures. 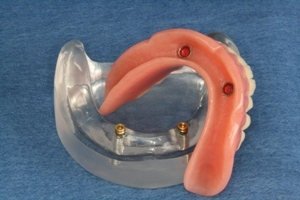 However, implant overdentures are significantly more affordable. This uses four to six dental implants on each arch and anchors your dentures to them. They are completely secure and will also prevent facial collapse. In some cases, even implant overdentures are still out of reach. That’s okay. Everyone has a different budget to work with and dentists should never pressure patients to extend themselves beyond their means. In those cases, we often recommend snap-on dentures. They are a good starting place. There is a picture of them at the top of this post. It uses just two dental implants. While there is some movement, they will not fall out. The snaps keep them in place. This also allows you to save up to get more implants at a later date if that is what you desire. It will also protect against bone loss, but just in the areas there are implants.